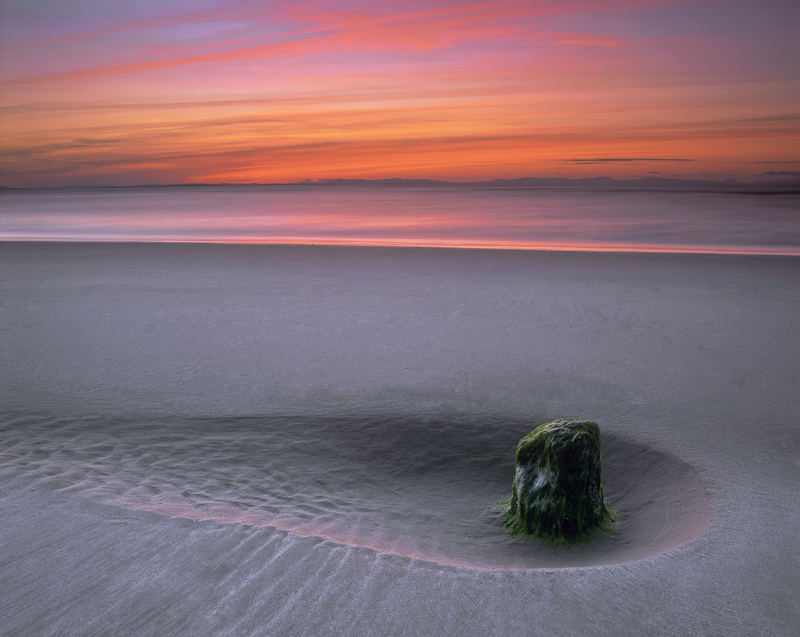 Findhorn is a pretty featureless beach on the whole but it does benefit from more of its fair share of decent sunsets. On this occasion an exceptionally low tide ensured that some of the wooden staves were visible near the waterline. These posts were designed to stop enemy aircraft landing on the beach during the 2nd world war. One of these posts had a wonderful depressed area of unblemished sand around it and the twilight afterglow had rimlit the edge. Ironically I was leading a group of photographers on this particular evening which was freezing, I had tried to encourage them to stay a litle longer on the basis of my suspicion that the sky would colour up but one by one they disappeared leaving me and one other grinning from ear to ear at our good fortune.